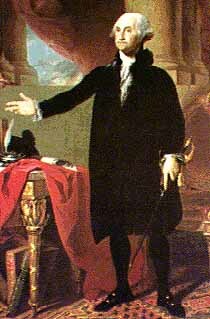 President Washington was a guest Apr. 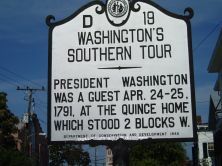 24-25, 1791, at the Quince home which stood 2 blocks W.
President Washington’s tour took him through the state’s rural countryside before he arrived in the coastal port of Wilmington. 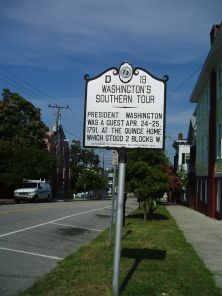 After a breakfast at an inn along the way, Washington was met by a welcoming party of several men from Wilmington on April 24. He arrived in the city “under a federal salute,” three discharges of fifteen guns each, and stayed at the home of Mrs. John Quince. Washington’s two-day stay at the Quince home was necessary because Dorsey’s Tavern was undergoing repairs and could not accommodate his party. The Quince home has been described as the “most pretentious home in the city” at the time and stood at the corner of what is now Front and Dock Streets. While in town, the President was treated to military parades, dances, and an illumination of the town at nightfall with a variety of lighting devices and bonfires. Washington recorded in his journal that Wilmington contained “some good houses pretty compactly built,” and that the census reported about 1000 inhabitants although many locals felt the census underrepresented the city’s population. After two days of entertainments, Washington left Wilmington on the morning of the 26th on an “elegantly decorated” barge. After breakfast with a wartime friend, Washington proceeded southward through Brunswick County toward South Carolina.